Knox Bro's Fruit Seasoning - Salsa en polvo. This specialty seasoning is just for fruit. Shown on fresh peaches, below. We blend mild Aleppo pepper with powdered organic lime juice, annatto and flake salt to make a tart seasoning that is an excellent compliment to the flavor of sweet fruit. Turn pineapple chunks, fresh mango slices, banana or even sweet summer berries into a south of the border treat. A colorful and tasty treat enjoyed as a street food in South America. 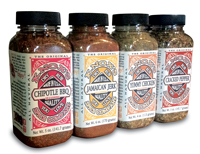 Like all our seasonings, Knox Bro's. Fruit Seasoning uses only the finest ingredients we can find. Aleppo pepper from Syria, Annatto powder from Mexico, organic lime juice powder and flake salt from the U.S.A..
Fruit seasonings can be found in any Spanish neighborhood grocery, salsa en polvo is what it is typically called. They are used on fresh fruit to add color and enhance the natural sweetness of the fruit. Knox Bro's. 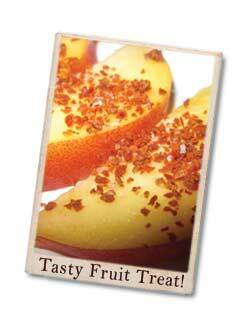 Fruit Seasoning uses crushed Aleppo peppers as we found them to be the most flavorful but very mild for our blend. This seasoning is surely a tasty treat. Just sprinkle over freshly cut fruit to turn it into a fruit treat worthy of serving as a dessert. You will find yourself eating much more fruit and even serving fresh fruit as a snack more often as Knox Bro's. fruit seasoning makes it fun with a delicious twist. All natural and gluten free. Order yours today.